People use the term “green goddess” for just about any recipe with a lot of green in it, but classic green goddess dressing is a combination of herbs–parsley, tarragon, and chives, to be exact–blended with spinach or watercress, garlic, anchovies, lemon juice, vinegar, oil, and mayo. There are variations, of course–some recipes add sour cream or different types of vinegar, others add basil or even cilantro. But the idea is the same: a dressing that’s herbaceous, creamy, and bright. 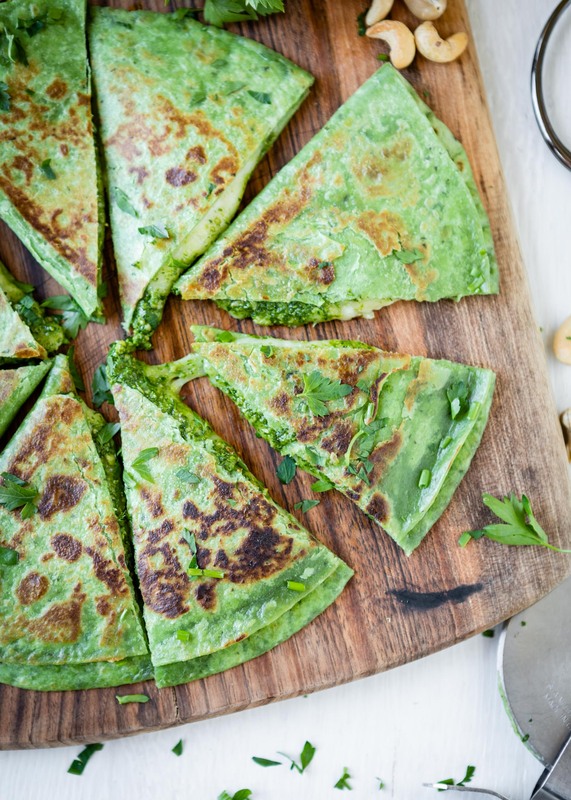 These Green Goddess Quesadillas have all three of those elements, but in slightly different forms. 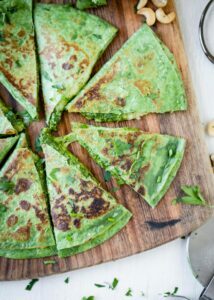 Herbs, spinach, garlic, lemon juice and oil are combined with raw cashews in a food processor to make a green goddess pesto; melty Monterey jack cheese is added to the quesadillas for maximum creamy cheesiness. And it’s all sandwiched in a crispy green tortilla. Gotta keep it green, right? Normally I load my quesadillas with tons of vegetables and beans, and you can absolutely do that with these–cannellini beans would be quite nice, as would chopped broccoli, zucchini, shredded carrots, or sautéed mushrooms. But I prefer keeping these simple so the flavor of the pesto really comes through. A homemade green goddess pesto is combined with melty jack cheese to make the ultimate weeknight dinner. 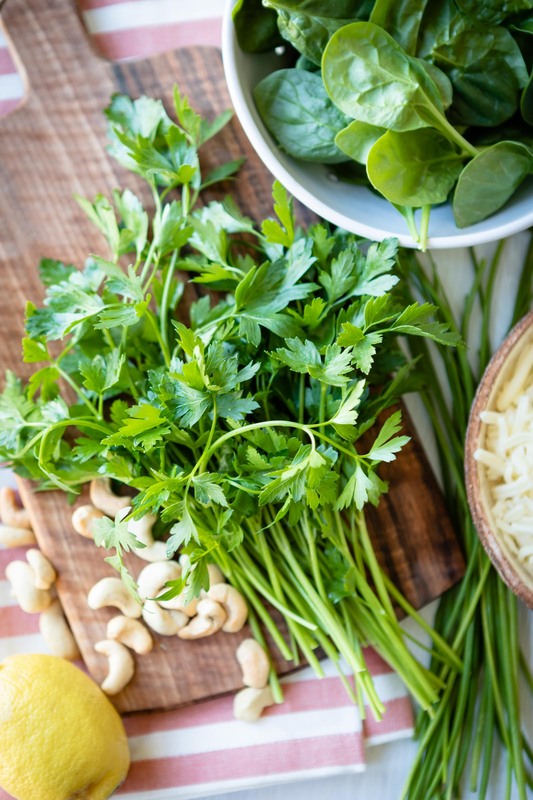 Combine all of the pesto ingredients in the smallest bowl of a food processor. Process until smooth, adding additional water a tablespoon at a time if needed. Season with salt to taste. 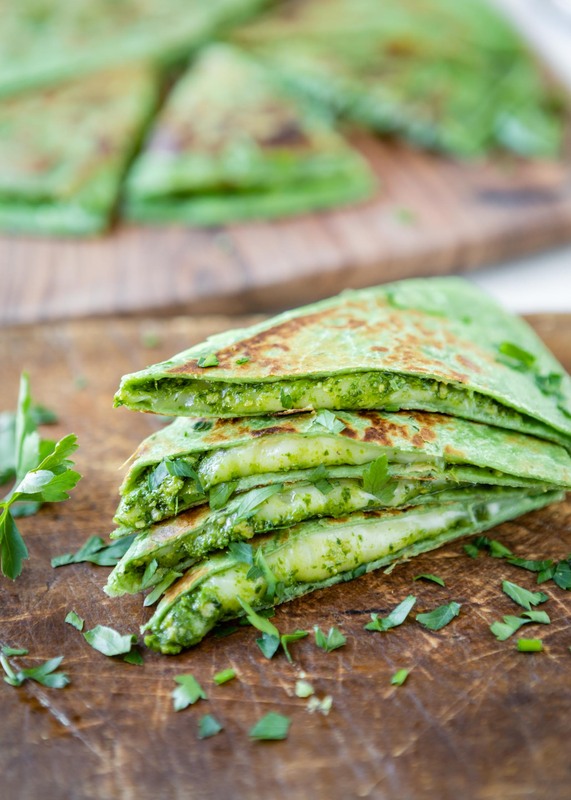 To make the quesadillas, spread the pesto onto one half of each tortilla. 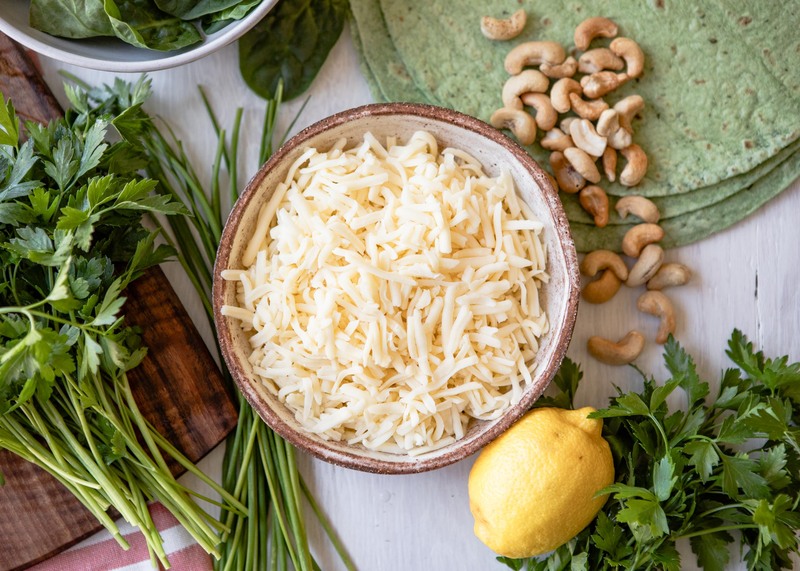 Cover the pesto with cheese, then fold over the top of the tortilla. Heat a teaspoon of oil in a medium cast iron skillet over medium heat; swirl to coat. Place 2 quesadillas in the skillet and cook until lightly browned and crisp, about 3 minutes on each side. Add another teaspoon of oil to the skillet and repeat with remaining quesadillas. Cut the quesadillas into wedges and serve.